There haven’t really been any developments. Showing interest and finalizing deals are two very different things, and we probably have a long way to go before things start heating up. In other news, the Bruins bested the Penguins, 4-3, as well as the Rangers, 3-2, and Blue Jackets, 3-1, but lost to the Red Wings, 6-1. And the Pats edged the Broncos, 34-31, in a real mess that eventually turned into a real awesome victory. The first half of that game was an epic disaster. I didn’t even know what team I was watching. And as a result, I didn’t even know what team I was watching in the second half, either. It was a situation of polar opposites, and the win was just unbelievable. The inclement weather gave us a spontaneous day off, although the game was postponed, so we’ll have to make it up later. Speaking of which, that is also what we did today. It turns out that the extra off day was right on time; making up a game previously rescheduled, we had a twin bill. We lost the opener. Doubront took the loss but Morales didn’t help any. Doubront gave up only three runs in six innings of work; that’s a quality start. None of the runs scored via the long ball, which means that they were not the products of isolated mistakes. However, Doubront by no means had a bad day. He actually looked pretty good. And if the Angels had been held to three runs, then all else being equal, we would have walked away the victors. Morales, however, gave up four runs in the seventh inning alone. Not counting the outs, he gave up a double, an intentional walk, an RBI double, another walk that loaded the bases, and two consecutive walks that both walked in runs and re-loaded the bases each time. Then he was lifted for Mortensen, who gave up a single that allowed one of his inherited runners to score. It was awful. Morales could not find the strike zone at any time. His terrible performance made the two outs that he managed to record look like accidents. Mortensen pitched until he allowed two singles and a popup in the ninth, when Miller took over. Miller gave up a walk to load the bases, which was obviously the theme of our relief corps’s performance. One force out later, he walked in a run of his own, and a fielding error by Napoli resulted in the Angels’ last run of the morning. Carp hit a solo shot to lead off the fourth for our first run of the day. Two outs later, Ellsbury walked, stole second, and scored on a single by Nava. We were still fighting even in the ninth inning; we hit three straight singles with two out plus a double that scored a total of two runs. But it wasn’t enough, and we lost, 9-5. The nightcap got off to an auspicious start. Victorino singled to lead off the first and scored on a double by Gomes, who scored on a double by Pedroia. The next inning, Gomes singled and scored on a double by Papi. The nightcap then continued just as auspiciously; Iglesias led off the sixth with a single and scored two outs later on a single by Pedroia. And it all cleared when Papi homered for two more runs. Buchholz gave up his first run in the third thanks to a double-single combination. He gave up his second run in the sixth thanks to a double and a sac fly. And that was it for him. Breslow and Tazawa finished the game, and the final score was 7-2. So we split. I would have preferred we sweep, but we’ll take what we can get. Now that’s what I call quick work. The Penguins never saw it coming. It was a clean sweep, culminating in a one-zip win. That would be twenty-six saves for Tuuka Rask and some timely heroics by Adam McQuaid. The Eastern Conference is now officially in the bag. We went from a win to a loss, from slugging to almost nothing. We could have spread out Tuesday’s run total, sharing the wealth between Tuesday and yesterday, and we would have won easily last night. That’s the nature of the game, I guess. Lackey gave up a solo shot in the fourth. We tied it up at one when Pedroia smashed a solo shot toward the Monster with two out in the sixth. It was huge. I am continually amazed by how much power he’s got when he unleashes. 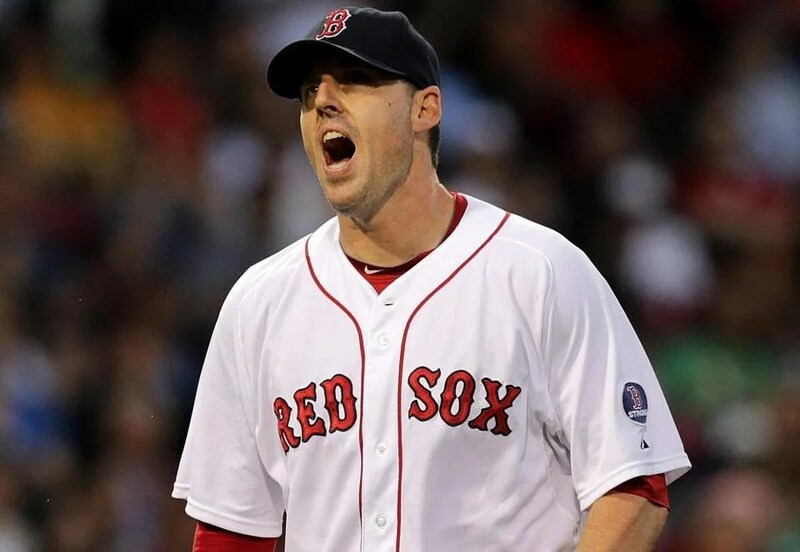 Lackey’s night ended after six. But they were six glorious innings. He gave up only one run on five hits; it was just the one mistake. He didn’t even walk anybody. Unfortunately, things fell apart when he left the mound. Breslow came on, allowed a double, picked up the inning’s first out, and issued a walk. Then he was pulled in favor of Uehara, who gave up a bases-clearing double. Tazawa came out for the eighth. In the bottom of the frame, Napoli walked with two out and scored on a double by Salty to trim the lead to one. Unfortunately, it was too little, too late. And we came up just short, 3-2. In other news, the Bruins finally beat the Penguins, 2-1, in sudden death! The Rangers didn’t stand a chance in this one. Seriously. No chance. I thought our run total against the Yanks was epic, but it turns out that I had another thing coming. And in this case, I am most definitely happy about that. We scored so many runs last night that if you cut our run total in half, not only would we still have won, but that total alone would have been considered a ton of runs in most situations. We did not waste time putting ourselves on top in this one. Really, we didn’t. From the very first, both literally and figuratively, we were winning and never looked back. Nava led off the bottom of the first with a walk, followed by a single by Carp. Then Pedroia struck out, and Papi hit an RBI double. Then Napoli walked to load the bases, and Carp scored on a groundout by Salty. Not exactly the response to a bases-loaded situation that we were looking for, but in the long run, we had absolutely nothing to worry about. Iglesias led off the second with a double, and Bradley promptly followed that with a homer to right on a 2-1 count. After that came a single by Nava, a walk by Carp, a flyout by Pedroia, a bases-clearing triple by Papi, and a successful sac fly by Napoli. Then Salty doubled and scored on a double by Drew. End our six-run second. Nava doubled with one out in the third and scored on a single by Carp. And Drew homered to right center field to lead off the fourth; Carp repeated that performance in the fifth. Then Salty led off the sixth with a solo shot. Drew singled, Iglesias reached on a throwing error, and both runners ended up in scoring position. Drew scored on a groundout by Bradley, and Nava hit a successful sac fly but ended up on third thanks to a fielding error, and he himself scored on a sac fly by Carp. A single by Salty, a double by Drew, and a bases-clearing single by Iglesias resulted in yet two more runs. While the offense was getting busy at the plate, Dempster was mighty busy on the mound. This, I have to say, was a quality start. The numbers don’t lie. He gave up a double and consequently a two-run home run in the fourth as well as a solo shot to lead off the sixth. All told, he pitched a nice, long seven innings. He gave up just the three runs on five hits while walking only one and striking out six. Easily one of the best starts we’ve seen from him this year. Mortensen came on for the eighth; he gave up a single and subsequently a two-run home run of his own. After that he gave up two singles and a walk and was subsequently replaced by Miller, who ended the inning. He aced the ninth. Well, we finally won by a score of 17-5. There was only one inning during which we did not score: the eighth. Obviously there was no need to play the bottom of the ninth. In the end we racked up nineteen hits. Thirteen of them were for extra bases: eight doubles, one triple, and four homers. And that, my friends, is how you play baseball. In other news, the Bruins completely knocked down the Penguins, 6-1. I don’t like losing to the Yankees. I’ve said that, if we absolutely have to lose, do we really have to lose to the Yankees of all teams? It’s a little different when you’re talking about wins. I love to beat the Yankees. If we absolutely have to win, I’d love to just win, win, win all the team. I’d love to win every single time we face the Evil Empire. It feels good. And it feels right, and it feels natural. Especially when it’s not even close. Then it gets really fun. We had a baserunner in each of the two innings, but things started to get really serious in the third. Bradley led it off with a double; Nava singled, putting runners at the corners. 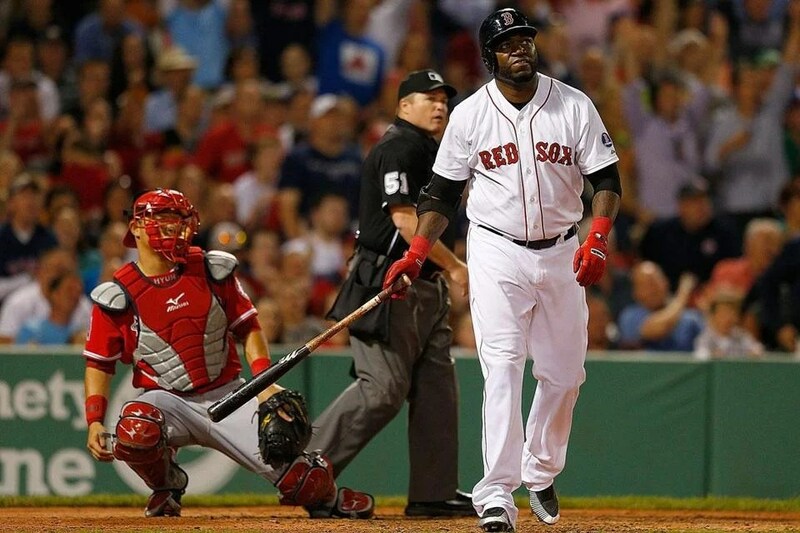 Bradley scored on a double by Carp, Pedroia struck out, and Papi walked intentionally to load the bases. And then it was Napoli’s turn. He swung through a fastball and watched another one go by. He fouled one off and took another one for a ball. He took a slider for a ball and got his fifth four-seam of the at-bat. Huge mistake. The count was 2-2, and the Yanks were only one strike away from out number two. But that one strike is pretty far off with a hitter like Napoli, I guess. Especially if you miss. Napoli is not one of those hitters who will miss it when you miss. Last night was no exception. The ball went over the fence in right center field. Mike Napoli, like it was no big deal, hit a grand slam. We had one baserunner in the fourth and two each in the fifth, sixth, and seventh. But we didn’t score. And our lead was very much intact by the time the eighth inning began. By the time the eighth inning was over, it wasn’t even a game anymore. It was The Boston Red Sox Show. Iglesias and Bradley led off the eighth with back-to-back singles. Then it was Nava’s turn. In total, that at-bat comprised four pitches: two curveballs that he fouled off, a two-seam that he swung through, and a four-seam that he sent over the fence in right center field. One swing, three runs, and almost double our lead. Drew got in on the action with one out in the ninth, belting a solo shot also on his fourth pitch, also on a fastball, this one going to just straight-up right field. Unfortunately, no one was on base at the time. But Salty doubled after that and scored on a single by Iglesias, and Bradley doubled after that and scored on a sac fly by Nava. The Yanks scored their first run one inning later. Doubront gave up two singles and induced a force out that put runners at the corners; the second out of the inning proved to be a successful sac fly. Other than that, Doubront just put it on cruise control, and it was smooth sailing through six innings. He was a master. Tazawa, Breslow, and Uehara each pitched an inning to end the game. In total, six members of the starting lineup had multi-hit games: Drew and Salty both went two for five, Carp went two for three, Bradley and Napoli both went three for five, and Nava went four for six in the leadoff spot. We walked only three times but posted a whopping eighteen hits, seven of which were for extra bases: four doubles and three homers. We left nine on base and went only five for fifteen with runners in scoring position. And now, it is my great pleasure to proudly state the final score: 11-1. That, folks, is just about as lopsided a slugfest as you can get. In other news, the Bruins have officially begun our series with the Penguins. And we are now officially in the lead! We shut them out, three-zip. On to Game Two! It’s good to be back. It’s so good to be back. We really needed the team to be at home, and we needed the healing effects of the pre-game ceremony which, as usual, was perfect. There was a video tribute to the marathon and the victims of the tragedy as well as the photographs of the brave law enforcement officials who did all that they could for them and for this city. And then there were photos of how it all ended. Victims of the tragic events as well as law enforcement threw the ceremonial first pitch. The American flag flew, the national anthem played, Neil Diamond led the singing of “Sweet Caroline,” Papi made a very heart-felt announcement, and Bailey even took a page from Jonathan Papelbon’s book, taking the mound for the ninth to the tune of “I’m Shipping Up To Boston” by the Dropkick Murphys. It was truly an event of healing, of contemplation, and of class. And it served as yet another reminder of what a remarkable place this city is and how strong our community is. 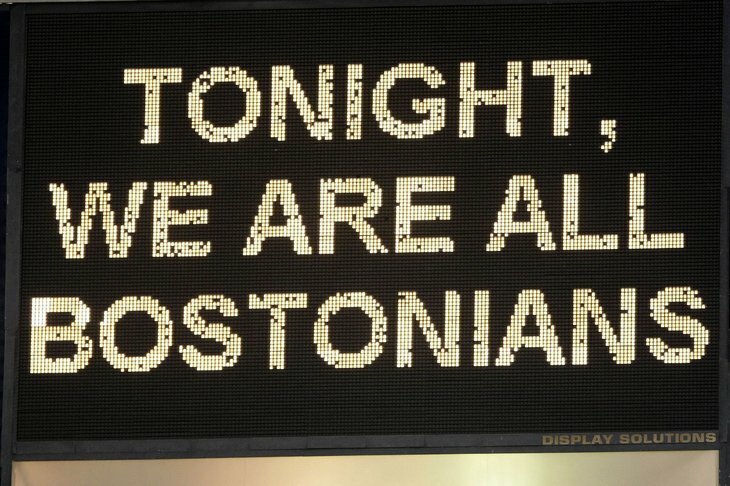 We are and will always be Boston strong. And then it was time for the healing power of escape, facilitated by this game and this team we all know and love. Buchholz, who repeatedly looked up to watch the moving video during his warmup, pitched eight full innings of two-run ball. He gave up eight hits, walked one, and struck out six. He threw 104 pitches, seventy of which were strikes. That is ridiculously efficient; we consider pitchers efficient if they get through seven innings with one hundred pitches, and most pitchers on most teams consider themselves lucky if they get through five or six innings with one hundred pitches. Buchholz had a one-two-three inning in the first, third, and fourth. He gave up a single in the second and his first run in the fifth as a result of a double-flyout-single combination. He gave up a double to lead off the sixth and a double that turned into a run thanks to a triple in the seventh. He gave up a single and his only walk of the game in the eighth. Bailey’s ninth was quite a close call. He gave up a solo shot to lead off the inning and gave up a single and a walk over the course of the rest of it while recording the three outs he needed to close the deal. If we didn’t have a two-run lead at the time, that home run would have tied it up. We were one run behind by the time we finally scored; we didn’t get on the board until the sixth. Pedroia walked in the first, and Napoli walked in the second, which was erased thanks to a double play. We went down in order in the third, and Papi, fresh off the DL, singled in the fourth (his at-bat in the first ended with a flyout). Nava walked and Drew singled in the fifth, our biggest thus far, if you could call it that. Finally, the sixth rolled around. Ellsbury led it off with a single, moved to second on a sac fly by Victorino and then third on a groundout by Pedroia, and scored on another single by Papi. We’d tied the game with that run but entered the seventh down by one yet again. Nava got hit but was picked off trying to steal second; Middlebrooks singled, Drew reached on a force attempt, and if Nava hadn’t been picked off, the bases would have been loaded for Salty, who popped out. We blew it as open as it was ever going to be in the eighth, when we were down by two. Gomes led it off with a double, Pedroia walked, and Papi grounded into a double play. But then Napoli walked, and Nava took a four-seam for a strike and another four-seam for a ball. Then he got all of an eighty-eight mile-per-hour changeup that he sent beyond the right field fence. The ball needed the encouragement of Nava yelling, “Stretch!” in order to get out. Maybe it was Nava really wanted to make up for getting picked off, maybe it was baseball physics, or maybe it really was the will of everyone there who really wanted to win this one. Either way, one swing. Three runs. Done. The final score was 4-3. We needed this one. This one was for us. The Bruins were also back in action, unfortunately losing to the Penguins, 3-2.